Hands down, this novel may have one of the strongest female characters I have ever seen in YA. It’s also a very fun read, which is sure to entertain, and seems to be just the beginning of a long and enjoyable series. The Stranje House series might be the most girl power you’ll see in a while, and it’s set in Regency England. Sounds awesome, right? After (accidentally ) setting stables on fire while performing a scientific experiment, Miss Georgiana Fitzwilliam is sent to Stranje House, a school intended to turn her into a proper young lady… by any means possible. 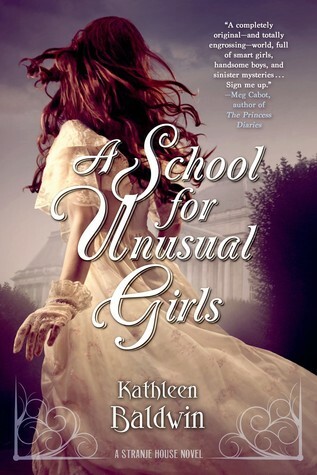 But things are not always what they seem in her strange new school: there are hidden passageways all throughout the walls, the girls she studies with are smart and secretive, and the headmistress seems to be encouraging them to be more themselves than actually trying to reform them. With England at war, and Europe in shambles, it seems as though the only hope for the nation lies with Georgiana’s invisible ink formula – which she hasn’t yet actually gotten to work yet. With the young and handsome Sebastian Wyatt as her lab assistant, she must perfect her ink, in order to change the course of the war. But can she get it done in time, and not loose herself to her heart? The characters in this novel are fantastic. Georgiana is a smart, independent young woman. She’s a scientist, a chemist, with a nose for challenges. While she never found support at home, she seems to thrive at the Stranje house. The headmistress pushes her with real, tangible deadlines (and consequences) and Georgiana rises to the challenge. And when Sebastian turns up in her life, she works to find balance between her feelings and her work. While I found the relationship a little bit forced, Georgiana never loses her head. The other women in the house are equally interesting. Some even have certain uncanny abilities which you would not expect to find in this kind of novel. One can seemingly speak to animals, another see possible futures in her dreams. They are all incredibly smart and dedicated to their cause. The one thing that annoyed was the weak plot. It felt a lot like the pilot for a TV show: lots of promise and exciting ideas for the series as a whole, but a shaky story right here and now. A lot of questions are not answered just to keep the story going. If they hadn’t said “not now,” a lot would have been resolved quicker. However, I feel like the rest of the series will be a whole lot of fun: a spy story, with cool female protagonists? It’s going to be great.